Peeps are a popular Easter treat that people have very strong feelings about. You either love them or you hate them. I think Peeps are cute and it simply isn't Easter without them. Whether you are a Peeps lover or hater, I guarantee that you will love this cake idea! 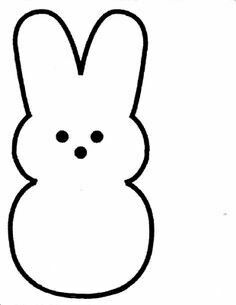 Take your Peeps bunny paper cutout and simply cut the pattern out from the cake with a knife. Remove excess pieces of cake from the cut bunny pattern. Place the cake onto a serving pan with two pieces of parchment paper underneath on each side. This helps for easy clean up while you are decorating. Use food coloring to color your frosting to whatever Peeps color you wish. I chose pink. Frost the entire cake including around the edges. Then apply your sugar sprinkles over the entire cake. Remove the parchment paper you placed underneath the cake. Lastly, using your chocolate chips insert (tip side down) into the cake as the eyes and nose, Enjoy and Happy Easter! In a blender add in the ice cream, milk and peeps and blend until smooth. Poor into a glass and top with whip cream, sprinkles and if you like a Peep. Enjoy!